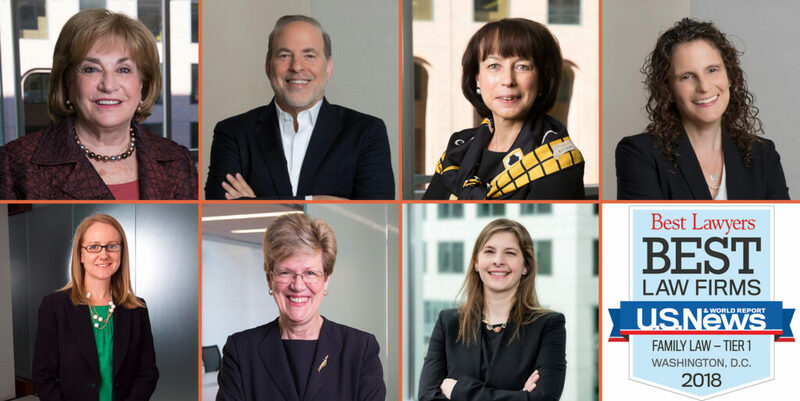 Jonathan Dana, Sarah Zimmerman, Marina Barannik, Marna Tucker, Katherine O’Rourke, Jennifer Davison and Mary Pence have been selected by “Best Lawyers of America” as among the best Family Law attorneys in the Washington, D.C. area. In terms of methodology, Best Lawyers surveys each attorney’s peers as to the quality of legal services provided by him or her. Their selections are nationwide in scope. The firm’s Family Law practice has also been recognized as a 2018 U.S. News-Best Lawyers™ “Law Firm of the Year” in Family Law -Tier 1 for Washington, D.C.